I spent a wonderful two hours yesterday evening with my 15 year old daughter and her oldest pal, we were discussing ‘why we are here’ and ‘belief’ and the theory of evolution. As the discussion developed, the realisation hit me that this girl, who attends a fee paying Catholic school, has been taught that there are two ‘belief systems’ that might explain where we come from and why we’re here. This single question revealed everything about her education. On the one hand is the traditional Christian belief that God made the heavens and the earth, the other is belief in evolution. Unlike the truly barking mad evangelical nutbags in many American schools who set out to prove evolution is the work of Satan or some other such fear based patriarchal mental torture, her British religious education is clearly far more subtle. Two ‘belief systems’, one written down on clay tablets by the newly powerful males of an ancient desert dwelling tribe 2-3 thousand years ago, one developed by countless scientists in a complex peer review process over the last 150 years. She is clearly being taught that these two ideas have equal weight. She is not taught that God made the earth 5 thousand years ago and gentle men in robes walked with Dinosaurs, her teachers fully accept that you have to be actually clinically insane to believe that… oh wait, that’s what is taught in many American schools. She is taught that while science may answer many questions about the development of the world and all that lives upon it, God created the universe in ways that are too mysterious for us, mere mortals, to ever understand. So I started to explain as best I could the difference between a theory and a belief. I explained how the theory of evolution was never written down as a law, it’s a theory which by its very nature is evolving, changing and developing as science allows us to investigate further. I tried to explained the process, how peer reviewed science is more like a discussion, where arguments are based on research, how the discussion is by its nature very complex and detailed, how scientists don’t all agree with each other. I tried to give examples of how new research can develop new strands of the theory, new techniques like mapping the human genome make it possible for us to read our genetic heritage. This young woman is bright, inquisitive and articulate, I’ve known her since she was 2. Her parents are well-educated, funny and charming people. They are practicing Catholics and clearly not bigots, racists or indeed homophobes. If they lived in the USA, they would not vote for Mitt Romney and would not support the Tea Party, and yet, I assume, they consider evolution to be a belief. I think this is still a truly fundamental problem standing in the way of our development as a species. In no way am I saying that human investigation into spiritual experience and a greater understanding of self is in any way backward looking, but concrete, law based religious belief is the yoke the human race most needs to shed. We now know the theory, not the belief, the very well supported theory the world is more than 5 thousand years old and that Dinosaurs died out quite a few million years before homo erectus emerged from the plains of central Africa. We know the theory, not belief that Homo sapiens are one species, many different cultures and languages but one single species. This is not based on laws written by a few old blokes sitting around a fire, but thousands of scientists who have spent lifetimes researching, cataloging and theorising on why birds have feathers, fish have gills and human beings have language. 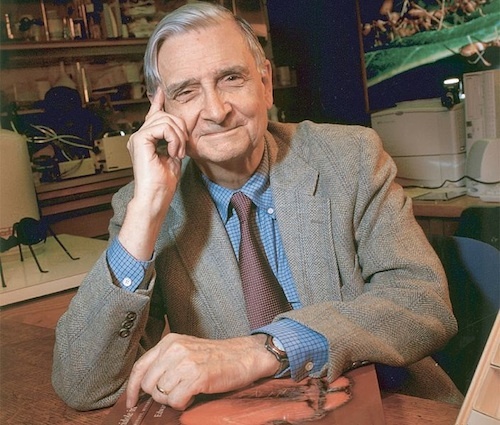 The two time Pulitzer Prize winning sociobiologist Edward O. Wilson wrote a book called ‘Creation’ in which he held out a friendly hand to religious leaders, claiming that together science and religion could further human understanding, so we can possibly assume he’s not a Dawkinite. I’m very grateful I’d heard him say that as yesterday evening I tried to introduce the notion of the theory off evolution without making it an attack on anything, rather something that required further investigation.